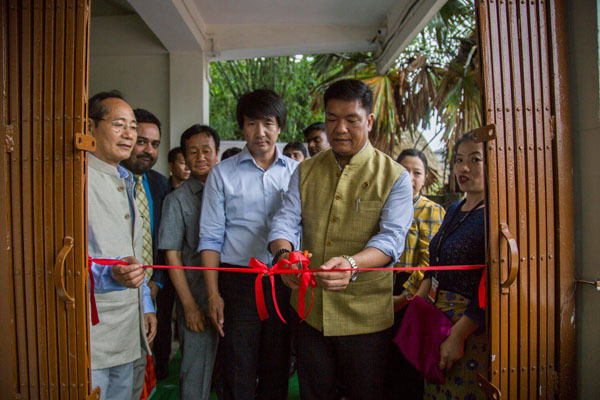 Arunachal Pradesh Chief MinisterPema Khandu inaugurated the Pradhan Mantri Kaushal Vikas Yojana training centre at Itanagar on Friday to provide skill-based training for the youths. As many as 240 students are undertaking courses in tourism & hospitality conducted by Orion Edutech. Jambey Tashi, Parliamentary Secretary, Skill Development & Entrepreneurship and other senior officers were present at the MoU signing by Onit Panyang, Secretary, Department of Skill Development & Entrepreneurship (SDE) representing the State Government and Jyotiska Maitra, Asst Vice President Orion EduTech Pvt. Ltd, Kolkata on Friday. Employable skill development training under PMKVY will be provided both in Kolkata and Arunachal Pradesh with 70 per cent job guarantee to pass out trainees. Orion EduTech Pvt. Ltd Kolkata is a Training Partner with National Skill Development Corporation (NSDC) and State Skill Development Mission under PMKVY. The first of its kind Training Centre in the state has been established by Orion Edutech Pvt Ltd, at Vivek Vihar Itanagar. 240 youths are undergoing training in Food & Beverages Services and Front Office Executive under Tourism & Hospitality sector at Itanagar. Khandu also flagged off the first batch of 60 youths who left for Kolkata on being sponsored by Department of Skill Development & Entrepreneurship for undergoing skill development training in same sectors and job roles. Youths are receiving training free of cost. Addressing the trainees the Khandu said “Through high-end skill programmes the government seeks to provide decent jobs and income. An amount of Rs 20 crores has been allocated under Chief Minister Yuva Kaushal Yojana which is a new scheme launched in the state for high-end training to 1000 students” said the Chief Minister. Onit Panyang, Secretary delivered the welcome address and called upon the youth to avail the Govt. schemes for their betterment and livelihood. The programme was also graced by Madhu K Garg, Secretary to Govt.of Arunachal Pradesh, Himanshu Gupta, Special Secretay CMO, Nitu Tsering Glow, Special Secretay SDE, Fr.Cyriac Director, DBYC and other official of the department.